Food Runners & Bussers needed. Must be available nights and weekends. Good work ethic and self motivated. Room for growth in the company. So one day, the owner saw a vacant site on the corner of Highland Avenue and Wharton Road in Glenside. 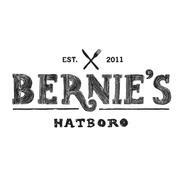 To be totally honest, he passed it twice a day for 3 years before he had the bright idea that the site could be the new home for Bernie's. The site had a lot to offer...located in Glenside, the hometown of the owner; close to Jenkintown and the Old York Road corridor and a few blocks away from the Keswick Theater. So, it had it all! A phone call to the land owner later that day and year of planning, refining and building later, you have what you see now...Bernie's Restaurant and Bar in Glenside...a roughly 170-seat restaurant (including the patio seating). Glenside has now been open for over a year and has become a neighborhood staple. Due to the huge success of our Glenside location, we were on the hunt to expand. We were approached about the former site of Cafe La Fontana and 58 York. We saw the great potential that the space had and couldn't resist! With almost double the space as our Glenside location, we had our work cut out for us and quickly got moving. On March 15th, 2017 the Hatboro location opened it's doors to the public after two and a half months of renovations.